IT took four hours for cops, paramedics and firefighters to cut through a drainpipe to get to a newborn baby. 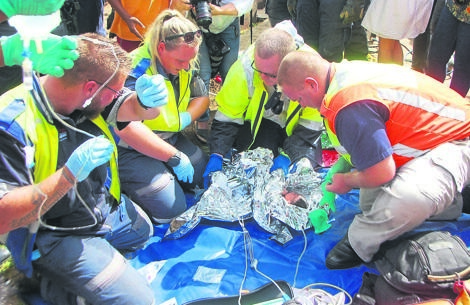 Residents of Newlands East, north of Durban, ululated and whistled yesterday when the abandoned little girl was rushed to a police helicopter. Rescue workers had to dig through about eight metres of mud to get to the pipe where the child was stuck. Resident Ntombi Bhengu (36) said she was at a bus stop with her child when she heard the baby crying. “I looked around and realised the screams were coming from the stormwater drain. “I called other residents and we tried to rescue her. “We looked down the drain and saw a baby stuck in the mud. Fire department commander Jesse Yasudas said it looked as if the baby was abandoned at about 3am. Yasudas said it was a miracle the baby was not injured as it appeared she was thrown into the drain. Provincial social development spokeswoman Ncumisa Ndelu said she would go to court to ensure the baby is placed under the department’s care after she is discharged. Police spokeswoman Colonel Thembeka Mbele said an attempted murder case was being investigated.